As we’ve seen in the previous section, blended learning can be defined in many ways. While a precise definition can be helpful, it is also helpful to simply consider the numerous interpretations of what blended learning can be and then work to define it for ourselves with our own context in mind. 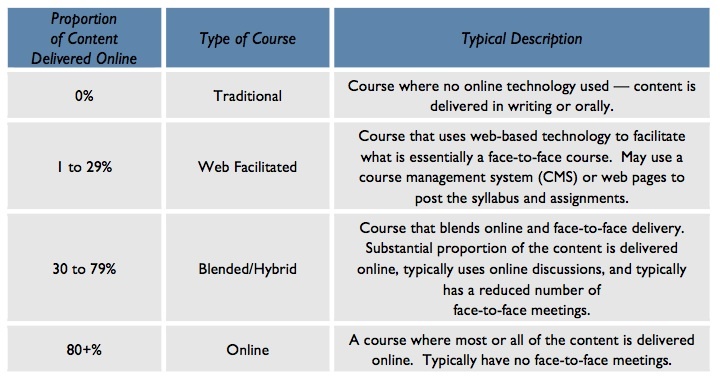 Erin McCloskey, Director of Curriculum, Distance Education Professional Development at the UW Division of Continuing Studies, describes key concepts and provides fundamental background information regarding distinctions between online and blended learning. Search the web for resources that define or characterize blended learning in whole OR in part. Choose a few definitions or characteristics that resonate with you. Variety is key to the success of this exercise. Post the definition(s) or characteristic(s) to the wiki page here: Blended Learning Definitions Wiki. Read and consider the definitions posted by other participants. In the following chapter, we’ll take this exercise one step further! Previous: What is Blended Learning?